Thanks to Rock Toews of Back Creek Books, the Line of Position library now boasts a fine third-edition copy of Capt. PVH Weems’ seminal book Air Navigation. Printed in 1943, at the height of World War II when military air navigators were in great demand to guide bombers and patrol aircraft over Europe and the Pacific, the book includes a wealth of information including line art, photos, tables, two fold-out charts (a sectional chart and a weather map), and, in a back pocket, a full-size reproduction of the navigation log from zoologist Richard Archbold’s 1938-39 aerial expedition to New Guinea in the flying boat Guba. The book’s 18 chapters and three appendices cover the essential materials (charts, compasses, and radios), the basics of “air pilotage,” and the various forms of navigation — dead reckoning, instrument flying (plus a chapter on meteorology), and celestial navigation. This edition goes to press under critical war conditions with the purpose of assisting national defense. Material on civil airways and other phases of air navigation, which would have been treated more fully under normal conditions, has been reduced or omitted in order to make the text as suitable as possible for practical navigation under war conditions. From the above quote, it sounds like it will be worth acquiring other editions of the book from both before and after the war, to compare the evolution of civil air navigation techniques. The Guba chart in the back of the book was a particularly pleasant surprise; it brought back some great memories from my college internship at the (tragically defunct) United Technologies Archive and Historical Resource Center in East Hartford, Connecticut. 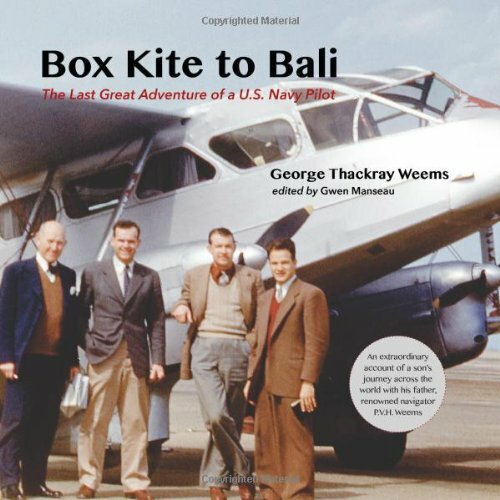 That’s where I first heard of Richard Archbold and the Guba, a Consolidated PBY Catalina. Because the Catalina was powered by Pratt & Whitney Twin Wasp radial engines that drove Hamilton Standard Hydromatic propellers, both companies (which later became units of United Technologies Corporation) published plenty of marketing and public-relations materials touting their parts in the Guba’s pioneering, long-range flights — much of which I got to read while I was there. It was one of the first times that I learned that there were so many forgotten and overlooked stories in the history of aviation, that one could devote a lifetime to learning about them. It was at the UT Archive that I began researching and writing about some of them, beginning with the history of Westinghouse Electric’s all-but-forgotten contributions to jet engine development — work that eventually led me to an internship at the Smithsonian Air and Space Museum and then to a Master’s in history — and, today, to my research into the life of Capt. Weems and the history of air navigation. And so things have come full circle!